Air pollution control systems designed to meet your unique operating situation. Ammonia is a colorless gas made of nitrogen and hydrogen with a strong and distinguishable odor that occurs naturally in air, soil, and water and is also a by-product of the normal biological processes of humans and animals. Ammonia is poisonous if inhaled in great quantities and irritates the eyes, nose, and throat in lesser amounts. Ammonia Scrubbers remove pollutants via a chemical reaction as opposed to Particulate Scrubbers which inject liquid into the gas stream. Ammonia Scrubbers have proven to be very effective at removing the ammonia from exhaust streams using this method. Manufacturers in the Chemical Industry are required by law to reduce or eliminate their ammonia gas emissions. Turn to Pollution Systems for reliable, top-quality Ammonia Scrubbers that will provide outstanding performance with minimal maintenance. What IS an Ammonia Scrubber? In the case of Ammonia Scrubbers, dilute sulfuric acid (H2SO4) is typically used to neutralize the ammonia. The resulting byproduct, a form of salt, is collected and removed through the wastewater blow-down, as the treated air stream is exhausted through the stack. Efficiency is critical for Ammonia Scrub-bers. Due to its toxicity, ammonia gas is a regulated compound that needs to be treated below established limits before it is released into the atmosphere. Pollution Systems is a leading manufacturer specializing in Packed Column, Wet Ammonia Scrubbers. Our experienced design team is focused on developing a solution to fit your precise needs and circum-stances. 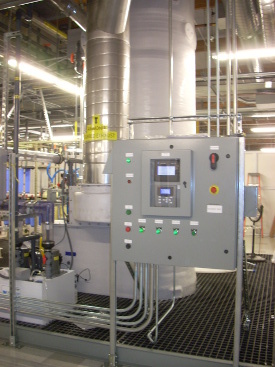 We design and manufacture complete Wet Ammonia Scrubber systems, including all necessary equipment such as system fans, pumps, exhaust stack, and instrumentation & controls. 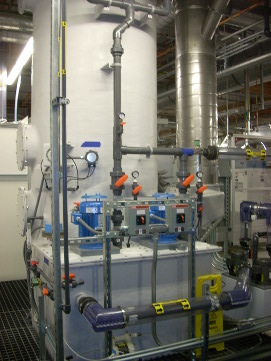 Let Pollution Systems design a Wet Ammonia Scrubber customized to match your precise application and process. Our custom-built systems will provide you with outstanding, long-term performance and low maintenance requirements.